Winter storms brought down trees, triggered mudslides and damaged homes across the Bay Area, and local sensations – of the ape kind – were among those affected by the relentless rain. Community members, however, jumped to the aid of beloved gorilla, Koko, who is famous for being able to communicate using American Sign Language, and her friend, Ndume. 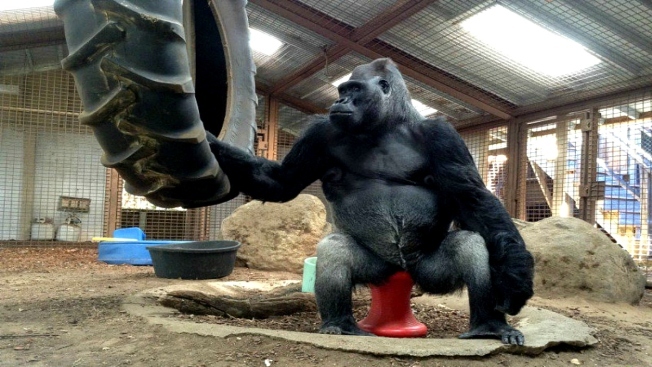 The duo live in enclosures on the Redwood City premises of the Gorilla Foundation, but tragedy struck during a particularly wet winter season. "After many weeks of rain and hail storms in Northern California (and the anticipation of more to come), the roof to Koko and Ndume’s play yard and sleeping quarters needs replacing, as it has sustained damage from the very heavy water flow," Lauren Russ, one of the gorillas' caregivers wrote on a GoFundMe page created to help the duo. Strong gusts of wind had blown off shingles from the roof, Russ said. Russ put out a call for funds on March 6, and in just a month, more than 700 people had donated $35,000. Of that, roughly $27,000 came via GoFundMe, while the rest was contributed directly to the Gorilla Foundation’s website, an elated Russ wrote in an update. Koko, born in 1971 at the San Francisco Zoo, has lived on the Peninsula since she was 8 years old. Ndume joined her in 1991. Koko is part of the Gorilla Foundation's research-based Project Koko, which launched at Stanford University, and explores ways to communicate with gorillas. Fluent in sign language, Koko befriended late actor Robin Williams. When she learned of Williams' death in 2014, Koko expressed sadness, the Gorilla Foundation said. The Gorilla Foundation team plans to replace the damaged roof in April, and promises to post updates on their social media pages.